The village of Bosteri is a tourist resort on Lake Issyk-Kul in north-east Krygyzstan. It is just sixty kilometres as the crow flies from Almaty in Kazakhstan, though the road route via the Kordai border crossing is almost eight times that distance. We chose instead to drive from Bishkek, a four and a half hour slog that wasn't improved by severe indigestion. On the plus side, virtually all of the road was in good condition; there was just one stretch of about five kilometres under reconstruction, and we did see quite a number of interesting market stalls along the way. The key draw of the area in the summer months is the weather, which is very noticeably cooler than pretty much everywhere else in Central Asia. For our visit the mercury peaked at a balmy 25°C (77°F), and perhaps unsurprisingly the conditions had brought out the multitudes. When viewed from above the beach was a constellation of multicoloured umbrellas, with the only visible sand being designated corridors for swimmers to get to and from the water. Up close was better, but not much; though we didn't explore for ourselves I got the impression that we'd have to trek a very long way to find a plot large enough for a group of six. The beach has a number of standalone water slides available on a pay-per-ride basis, and these looked to be doing an active trade despite the obvious difficulties in carrying money while wearing swimwear. 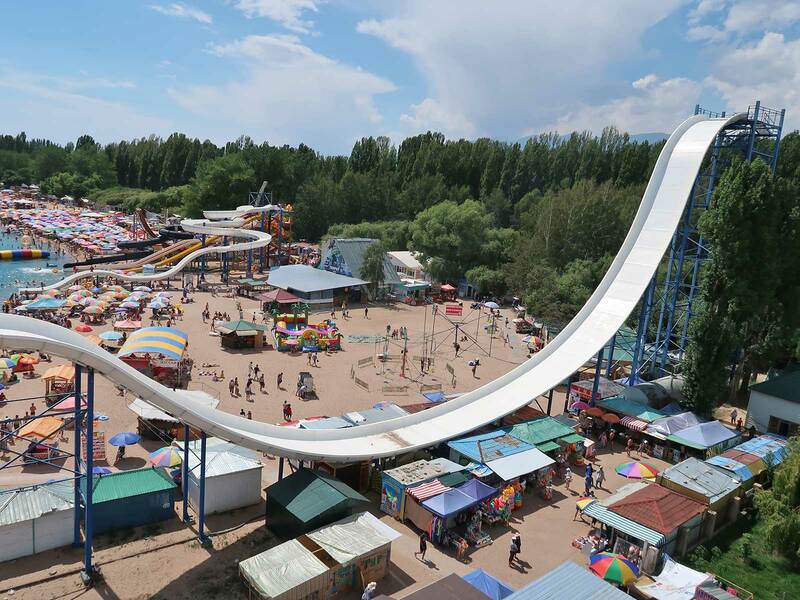 The most interesting for the average visitor is a death slide with two airtime hills stretching around fifty feet and ten feet respectively. This was out of service today, and the accumulations in its trough suggested that it had been down for a while, perhaps as a consequence of the terrible accident that took place at Schlitterbahn in 2016. There were also a number of more traditional tube slides, and a gated children's water play area with small slides and a tipping bucket. 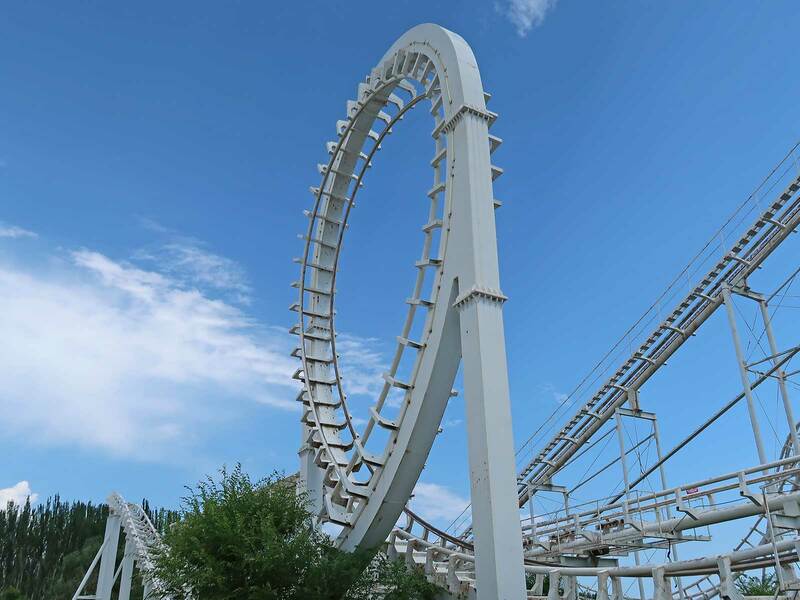 Roller Coaster (#2482) is as of this writing the only known example of the Three Ring Roller Coaster, a loop and double corkscrew from Zhejiang Juma Amusement Equipment. This is eminently fortunate, and something that I hope does not change, as the ride is an utter abomination. The general appearance of the track is not that dissimilar to Arrow products from the eighties, though an astute observer looking at the loop from ground level will notice that the track spine is quite a long way off center (see below), casting quite a bit of doubt on the build quality. The train resembles Vekoma products from the same period, though as with other Chinese hardware each seat has multiple restraints, namely a seatbelt, an overhead harness, and a redundant buckle to hold the harness in place. Today the operators were insisting that every seat on the train be filled prior to dispatch. This was not a quick process due to the 300 som (~€3.73) ticket price. Though not a lot of money by western standards this price represents around two percent of the average monthly salary in Kyrgyzstan, and almost half what one would expect pay for a night in a cheap hotel in the locality. Much of the train was occupied by the time our group got to the platform, and as a result Megan and I found ourselves saddled with the front half of the back car. It took around a quarter of an hour from the point that we sat down until the last two victims arrived. The train engaged the lift hill with an unpleasant clunk, but otherwise the first thirty seconds or so of the ride were handled without particular issue. The loop was negotiated with less drama than its appearance might have suggested, and though there was a slight sideways shuffle it's fair to say that I've ridden much worse. However, the turn immediately after was marked by a series of slams from side to side that the heavily padded restraint was unable to fully absorb, and the corkscrews that came after made a spirited attempt to knock me out. The train rolled back into the station at a crawl, having burned virtually all of its potential energy, but despite the slow speed the station brake still felt like hitting a brick wall, a final insult for what was uneqivocally one of the worst coasters I've ever ridden. Our Kyrygz guide told us that he'd never ridden a roller coaster, and asked whether he should; we told him that he definitely shouldn't start with this one. There was no way we were going to subject ourselves to a second ride. Instead we decided to do a lap on the Giant Wheel, a thirty-six car example with partially sealed cars; what might once have been glass panes had been replaced by clear perspex sheeting with grooves cut into it. The gaps were just about big enough to reach through with a small camera, and though this wasn't particularly comfortable (the edges were rather sharp) it was the only way to get useful shots, as a thin layer of sand obscured anything we might otherwise have snapped.